Tony Avent of Plant Delights Nursery in North Carolina registered this sport of H. 'Little Aurora' in 1998 and was granted a U.S. patent in 2000. It forms a medium size (11 inches high by 23 inches wide) mound of slightly wavy, faintly corrugated foliage. Very pale lavender flowers bloom from late June into July. 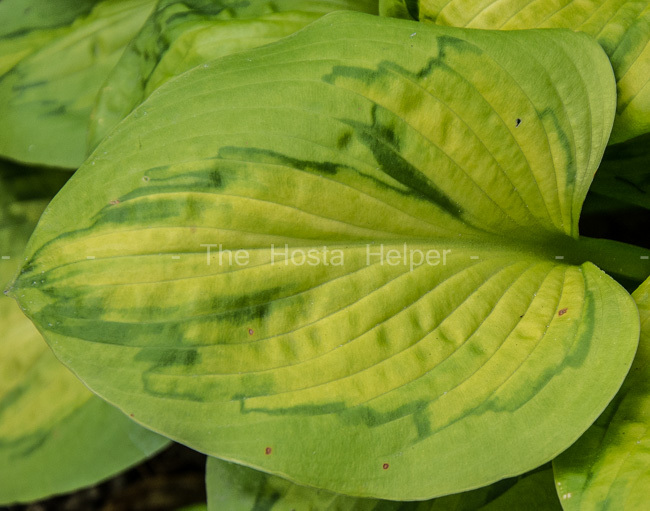 According to The Hostapedia by Mark Zilis (2009), it has a "...distinctive darker green "watermark" in the area between the margin and center...Though some have been successful with this plant in the garden, an equal number have failed with it. It tends to develop crown rot when grown in heavy soils, so drainage is essential..."
The New Encyclopedia of Hostas by Diana Grenfell (2009) states in its Hosta Hybrids for Connoisseurs chapter: "Plant as a foreground specimen or in a container so that the unusual variegation can be seen close up. 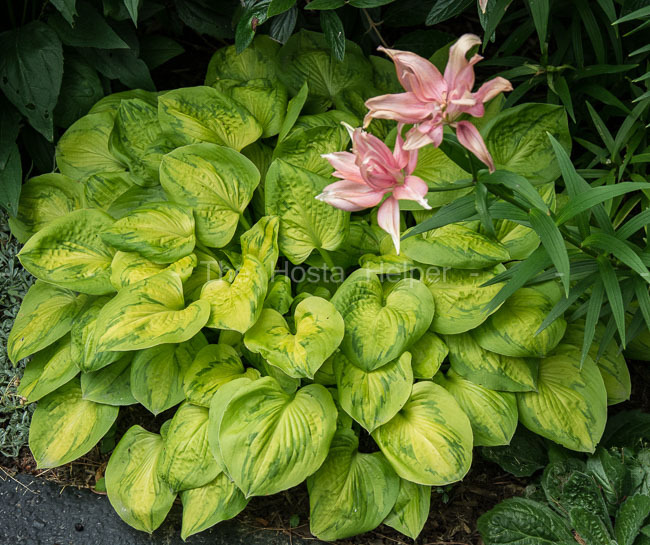 A quite distinct modern hosta and much prized by collectors, but it can dwindle rather than increase. Tony Avent advises that it be grown in a container until it has bulked up into a clump, ensuring that the new roots are developing." An article by W. George Schmid in The Hosta Journal (2009 Vol. 40 No. 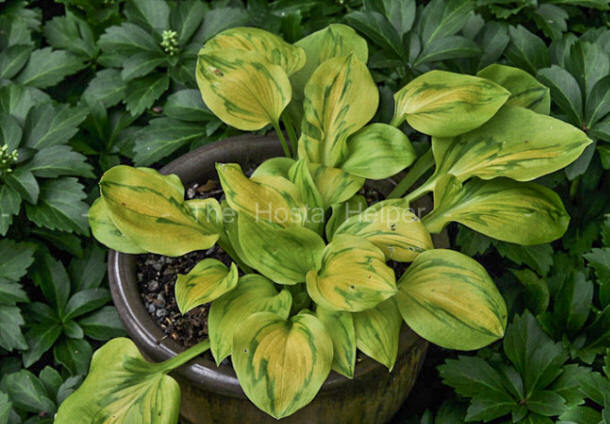 3) states that, "Hosta 'Tattoo' is one of the most unusual hostas on the planet. Some successful gardeners grow it well and just love it, but others consider it their nemesis...Tony Avent's Plant Delights Nursery offers a number of unusual hosta cultivars with even more unusual names, such as 'Get Nekkid', 'Banana Puddin' and 'Tattoo'...Considering the fact that 'Tattoo' has 'Tokudama' in its background, expected slow growth and I got it...Before I got 'Tattoo' number 2, I decided to look around for it when visiting gardens here (Georgia) and in other states...My research made one important fact clear to me: All of the "successful" gardeners grew 'Tattoo' in pots sitting in a water-containing saucer or in pots with a built-in bottom that holds water. That technique was so successful that some gardeners here in the South even brought potted 'Tattoo' plants through our drought." Sports include H. 'Tomahawk' and H. 'Va Va Voom'. 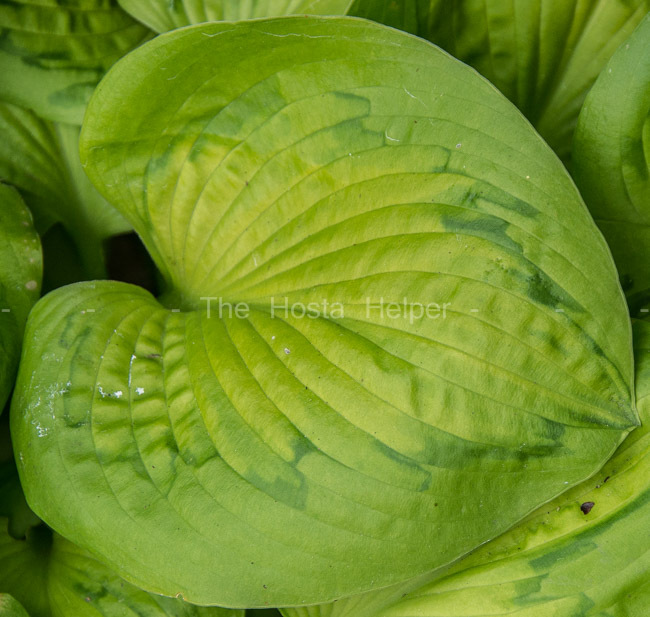 Abstract: A distinct cultivar of Hosta plant named `Tattoo`, characterized by its small, rounded golden green leaves with a distinct darker green maple leaf-shaped outline or "tattoo" in the center of the leaf; relatively compact plant habit; and light lavender flowers that are positioned above the foliage on strong and erect peduncles. The leaf shown above represents the "idealized" maple leaf variegation for H. 'Tattoo'. It was carefully selected to exhibit at a hosta leaf show. Generally, there is a wide range of leaf patterns on a plant in the garden. Below are some leaves typically found on this cultivar.